Schofield, W. B. 1985. 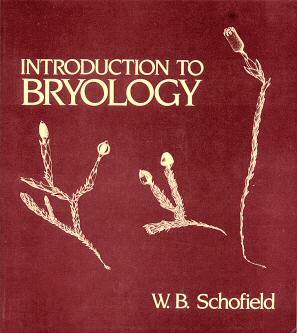 (Reprinted 2001) Introduction to Bryology. The Blackburn Press, Caldwell,New Jersey. Paperback.431 pgs. A comprehensive introduction to the biology of mosses, liverworts, and hornworts written by a leading bryologist. W. B. Schofield is Professor of Botany at the University of British Columbia, and former President of the American Bryological and Lichenological Society. The book is full of detailed black and white line drawings and some black and white photos of microscopic and macroscopic details of bryophyte morphology. Written at an introductory level, a basic knowledge of biological terminology and concepts is helpful. The text is lucid and covers morphology, physiology, life cycles, habitats, collecting, evolutionary trends, ecology, history of bryology, etc. Basic descriptions of the classes Musci, Hepaticae, and Anthocerotae, (mosses, liverworts, and hornworts) are followed by chapters devoted to selected subclasses, or orders. Each chapter contains an ample bibliography and there is a detailed glossary. The text is technically challenging, but greatly helps in understanding the characteristics of mosses and liverworts and goes far beyond what can be found in field guides. If you want to learn about mosses get this book.You should also skip a few meals so you'll be able to get Schofield's Some Common Mosses of British Columbia (1992).